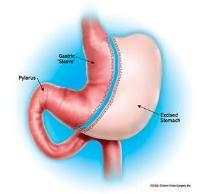 In a vertical sleeve gastrectomy, the surgeon creates a small, tube-shaped stomach by removing the greater portion of the stomach through keyhole incisions. The resulting pouch, about the shape and size of a banana, is larger than the pouch created during Roux-en-Y gastric bypass. By removing the outer aspect of the stomach, the majority of the cells that produce the hunger hormone ghrelin are removed and patients feel less hungry. For more information or to request a consultation, call 888-717-4463.